No, this isn't a thread about the liberal oldz of Crosstalk, though we are liberal and olde (like a malt shoppe). 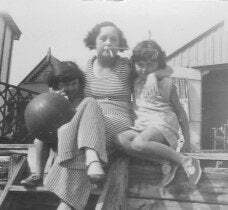 This is my great grandmother, hanging out with the kids, smoking at the beach in the early 30s. She claimed to be 10 years younger than she really was. She wanted people to call her Babette. She was a secretary for most of my grandma's life. And she married a bunch of times. She was a lady ahead of her time. Growing up in a tiny rural town, seeing her in her suits and high heels was fashion inspiration to my Mom and then to us all. She had issues but this isn't the time. She did learn to drive in her 60s. My mom always feared her 4'10" frame driving the volkswagon bug around the back roads of rural Canada with her cigarettes and stiletto heels. "I sure hope my kids don't die today!" Good times! We're not dead, btw. As an added bonus, for Burt as a reward for all her hard work on the Duggar story, I found this on my hard drive. YES. You are welcome. It reminds me of my picture here, btw, because it is all about me.